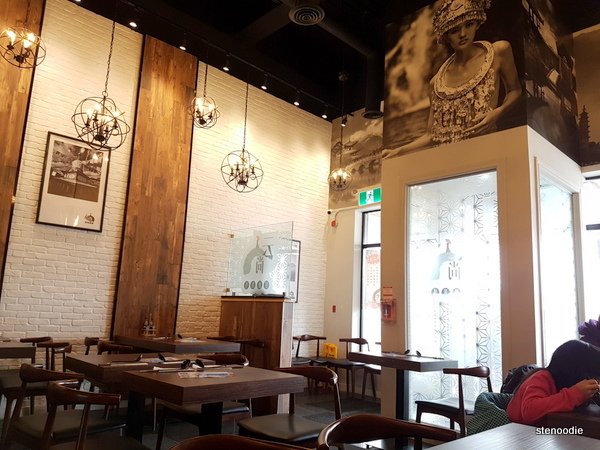 March 16, 2019: For a Saturday lunch, we visited the First Markham Place location of Yunshang Rice Noodle House (云尚过桥米线). 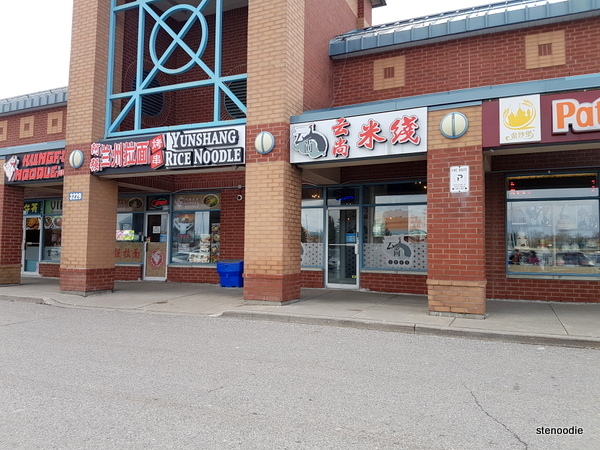 I had only recently visited this rice noodle franchise for the first time (the one in North York) earlier this month and realized that they have a location in Markham at Hwy 7 and Woodbine too. I already knew what to expect since there was no doubt that the menu would be exactly the same in all of their locations. This smaller location was nicely decorated with some trendy lights and monochrome portraits on the walls. 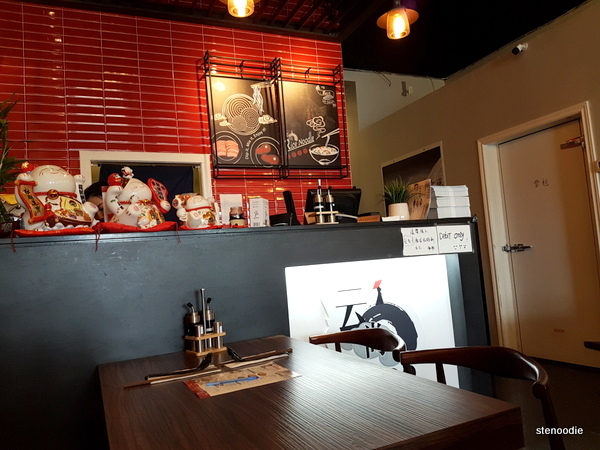 It was a cozy atmosphere for a simple and quick lunch (the pots of boiling noodle soup came out so quickly that you barely have to wait or spend much time in the restaurant — very efficient service). I ordered the Oriental Original Rice Noodle while my mom ordered the Oriental Rice Noodle with Tomato Sauce. 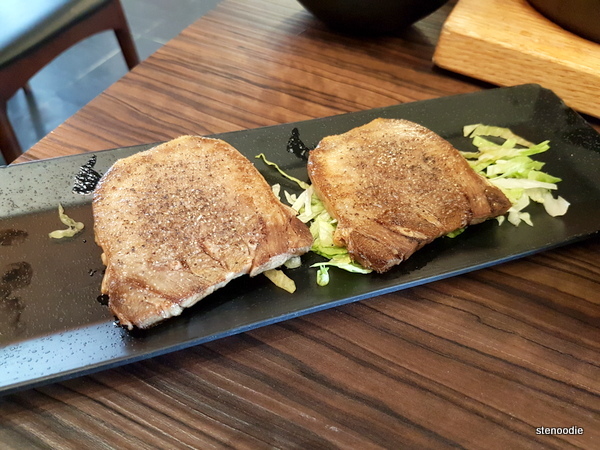 We also ordered the Teppanyaki Ox Tongue as an appetizer. The “cross bridge noodle” originates from a folklore story in Yunnan, China. 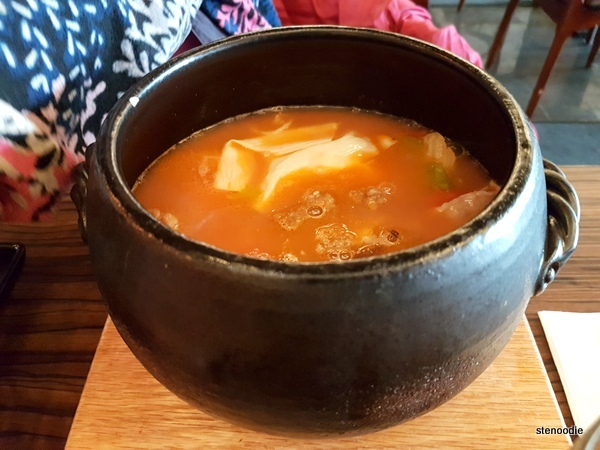 It consists of a boiling pot of soup broth that is brought out of the kitchen. 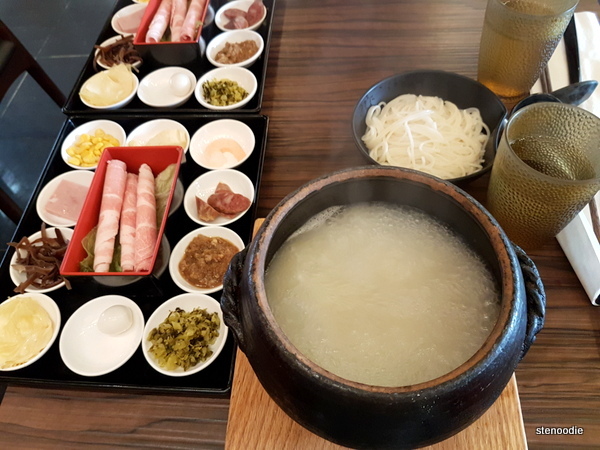 Once it is on your table, immediately put into the raw ingredients (especially the meats first) into the pot before plopping in the bowl of pre-cooked noodles. Swirl everything around with your chopsticks and even wait a minute or two before digging in so that everything is indeed cooked thoroughly. 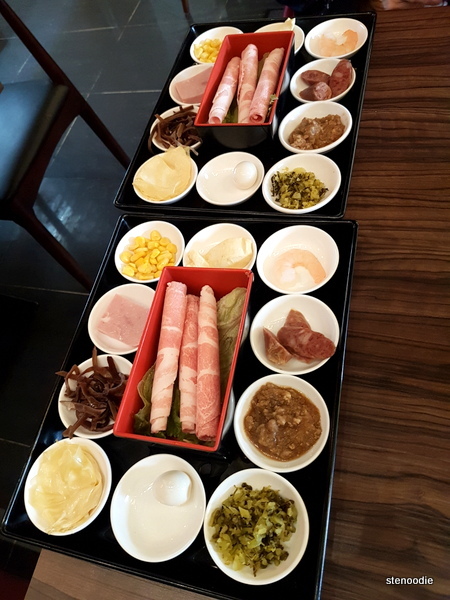 The raw ingredients include: Slices of beef, quail egg, black fungus, ham, corn, shrimp, fish cake, preserved sausages, beancurd sheet, preserved vegetables, and some sauce. 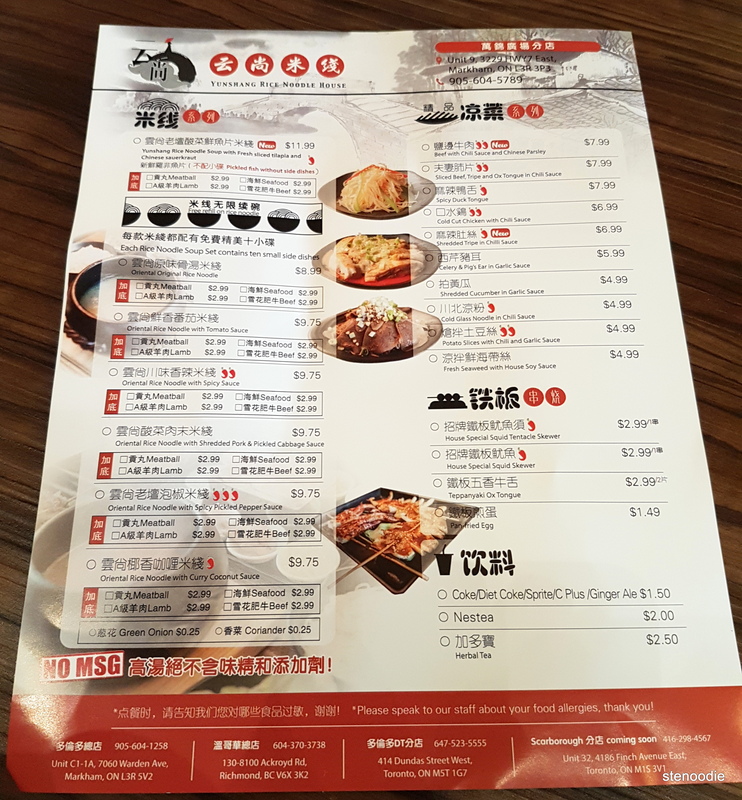 I remember really enjoying the broth at the North York location, so the blander-tasting broth here in the Oriental Original Rice Noodle was actually a little disappointing. 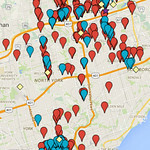 Perhaps the North York location was so new that they made sure that their broth is more concentrated than usual? The texture of the noodles were the same here as at the North York location. I did like how the slices of beef were thinner here than at the North York location. The solitary shrimp was also more fresh and firm here. The Teppanyaki Ox Tongue was delicious! It was tender and had just the right amount of salt and pepper on it to have an optimal umami flavour. I kind of wish there were more varieties of appetizers on their menu. Some of their appetizers are either spicy for me or mostly meat-based. 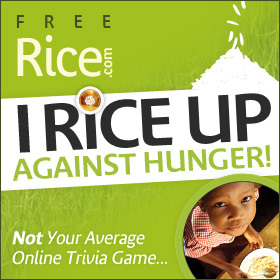 I like the fact that you can request for free noodle refills. The staff here were helpful and attentive. 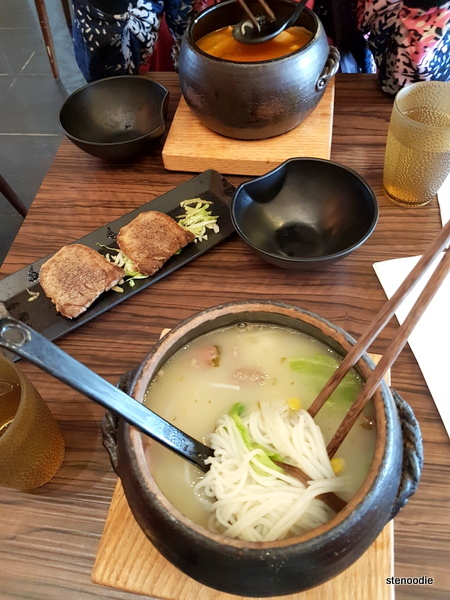 The server made sure to tell the guests about putting in the raw ingredients first before the noodles (otherwise, if you add the noodles first, you risk not having enough residual heat inside the pot to cook the actual raw ingredients). This entry was posted in Food and tagged cross bridge noodles, cross bridge noodles Markham, Cross bridge rice noodles, cross the bridge noodles ingredients, food blog, foodie, Markham, Markham cross bridge noodles, Markham food bloggers, Oriental Original Rice Noodle, Oriental Rice Noodle with Tomato Sauce, restaurant review, restaurants at First Markham place, rice noodles, rice noodles Markham, Teppanyaki Ox Tongue, Yunshang Rice Noodle House (FM) 云尚米线, Yunshang Rice Noodle House First Markham Place, Yunshang Rice Noodle House FMP menu and prices, Yunshang Rice Noodle Markham, Yunshang Rice Noodle reviews. Bookmark the permalink.